The desktop is available for Windows, Mac OS X and Linux. The mobile version is available on Android and iOS devices. Xbox One and Kindle users can also access to the app. You can apply one Skype account to connect devices on multiple platforms. Have no idea how to uninstall Skype for Mac? You may refer to this guide. Skype for Mac emulates the redesigned interface of iOS version, and it is able to connect to the iOS app across devices. You can customize the themes, choose different colors, sort messages in chat list by Time, Unread or States, and focus on a new notification pane to manage the mentions in group chat, replies and missed calls. Clicking on the notification will directly jump to the corresponding message window. Microsoft also enables the add-ins feature introduced in the Preview version, which allows users to directly add Giphy picture or YouTube video to the ongoing chat. A new chat media gallery is provided to help users quickly find media, links and files they want to share to friends. Besides, you can send reactions or set status updates even when in a video chat or a text conversation to keep your friends informed. 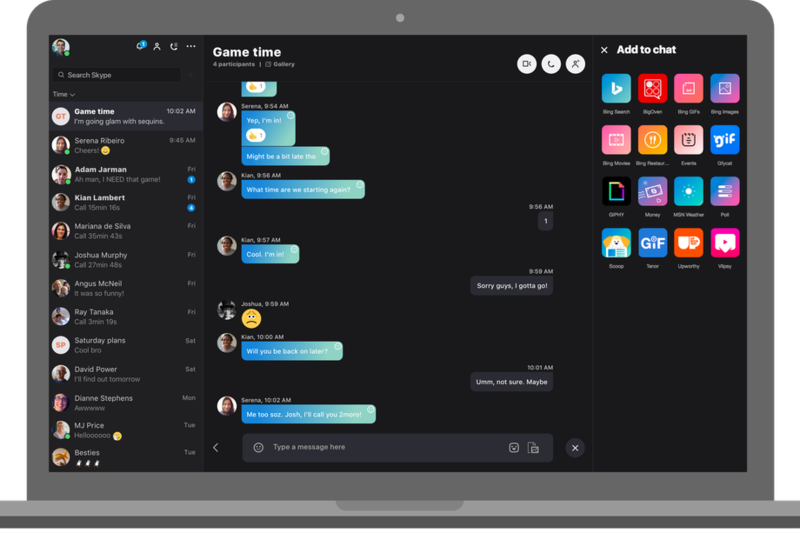 According to Skype, the new update is aiming at helping its users to increase personal and professional productivity and also unifying Skype ecosystem across devices. The latest version of Skype requires Mac OS X 10.9 or later. Users with automatic updates enabled on their Macs will receive the update after the roll out. You can also download and install the update manually by visiting Skype.com website.